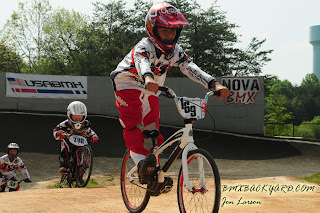 We were really fortunate to be invited to a super-awesome birthday party at the NOVA BMX track in Woodbridge, Virginia. The kids had a great time and were getting lots of fresh air and exercise, which was fantastic. I thought going into it that there was no way we’d make it more than 10 minutes (long pants and long-sleeves are required for safety reasons and it was 102 degrees! ), but the kids didn’t complain at all! Our track is owned by Prince William County Park Authority. We are a 501(c)3 organization and run solely by volunteers. 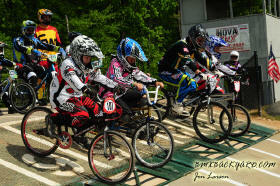 BMX is an individual sport and is very family oriented. BMX became an Olympic sport in 2008 and this year we are celebrating the 2nd year of BMX in the Olympics. It is a great sport and because of the Olympics it is growing in popularity. Unfortunately, our track seems to be one of Prince William County’s best kept secrets! We are trying to get the word out as often as we can. Hopefully your web site can help us accomplish this. The track, located at 7 County Complex CourtWoodbridge, VA 22192, offers clinics, races, and practice time memberships. Not sure if your child will like it enough to sign up for a 30 Day Membership? That’s okay- you can come out for a FREE one-day trial membership. A full-face helmet is another requirement, but the track has ones to loan. In addition, the track offers sanctioned practices with gate opening on Wednesdays at 5:30pm to dusk and on Sundays from 2-4pm. As far as competitive riding, it looks like races start at around $8, so this is a really affordable sport (once you’ve bought the bike!) especially compared to things like figure skating! The track also offers birthday parties, and would be a really fun outing for a scout troop, too. At the party we went to, we rode first and then did a tailgate in the parking lot. It was such a fun event!! I’ve never been to a party like it, and even younger siblings (no training wheels are allowed on the race track) had fun on the blacktop that surrounds the track. Disclaimer Time: PwcMoms.com was not paid or compensated. While this review is a fair and accurate representation of our views, it is important to know that BMX is a physically strenuous and potentially dangerous activity. PwcMoms.com does not assume any liability for injuries sustained partaking in any type of sport or activity reviewed on our site, including BMX.